Microsoft Office for Mac 2011 suite is available in 13 languages. Office for Mac versions include: Home & Student Edition, Home & Business Edition and Academic Edition. If you have upgraded Office for Mac 2008 or purchased new Microsoft ‘Office for Mac’ 2011 – then checkout PDF product guides to learn new features in 2011 version of Microsoft Office for Mac. 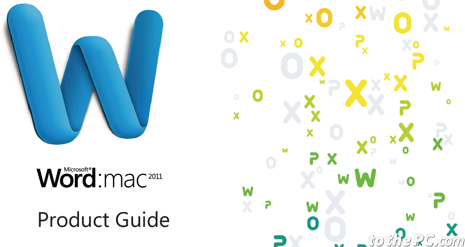 The Office for Mac 2011 product guides provide an overview of what is new in the Microsoft Office for Mac 2011 programs. It provide a deeper look at benefits across all Office 2011 programs. There are 4 different PDF guides for each program contained in ‘Office for Mac’. Click here for download page to grab product guide for different programs of ‘Office for Mac’ 2011 version. Guides are in PDF format and MAC users will need free Adobe Acrobat Reader to view PDF product guides.